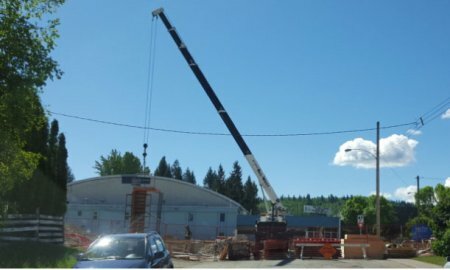 All-West Crane and Rigging has served clients in British Columbia for many years, and it supports	the equipment and service needs of Quesnel builders. We offer	crane load charts to help select the best cranes for the job, and offer	large and small cranes for rent, as well as	cranes for sale in Quesnel, BC. Customers requiring mobilization and economics are well-served by our Link-Belt	cranes. They are just the right crane equipment if you need a small working	footprint, large reach, and high lifting capacity with the benefits of	mobile crane rental. Privately owned and operated and BCCSA-certified, we’re just as equipped	to support your crane needs as much as the health and safety of the work	site. We hold the same standards in protecting our own employees as for	yours, so spider crane rental, crawler crane rental, and crane rental	that customers have depended on always come with safety. All-West is also	the go-to company in Quesnel for builders with jobs requiring multiple	cranes. A team of skilled operators and service professionals is on hand	to assist in every aspect of your project. We offer many options, depending on the crane and boom truck capacity you	need. If you need to rent a 90-ton Link Belt crane, 55-ton crane, or 100-ton	mobile crane, our fleet is fully stocked. Other systems available include	a 110-ton telecrawler and 130-ton rough terrain system. Lighter capacities	are supplied, too, in Quesnel, with our 18-ton boom truck, 8.5-ton carry-deck,	and mobile mini-crawler for on-floor applications. Support equipment: Bobcats, forklifts, enclosed trailers, and car haulers can be supplied	to address our customers’ needs and concerns. Transport fleet: A fleet of transportation vehicles can transport each boom lift or crane	to the job site, driven by professionally licensed truck drivers who can	deliver each unit right to you in Quesnel or anywhere in British Columbia. Cranes for sale: Rentals are often the most economical solution, but we also cater to residential	and commercial Quesnel builders who are looking to purchase items we replace,	at a reasonable rate. 3D lift planning: We employ software and online meetings to select cranes that make the	work site most efficient and safe. Using lift object dimensions and weight,	and the locations and dimensions of site obstructions, we can economically	select and deliver the right equipment, often providing cheaper lift solutions	than originally projected. Equipment sales: Man-baskets from Diversified Products, fitted outrigger pads from DICA,	and material handling solutions from Caldwell are available. We also offer	warehouse space for rent in Quesnel in a 15,600-square-foot facility. If you’re looking for crane charts, the exact size can be found. We’ve never let customers down and afford fast access to a 50-ton	crane load chart or any size your job demands. See the results from our	years of experience and customer satisfaction, with the	gallery and	testimonials on our website. For assistance, contact us online or call	877-203-0069 in Quesnel.